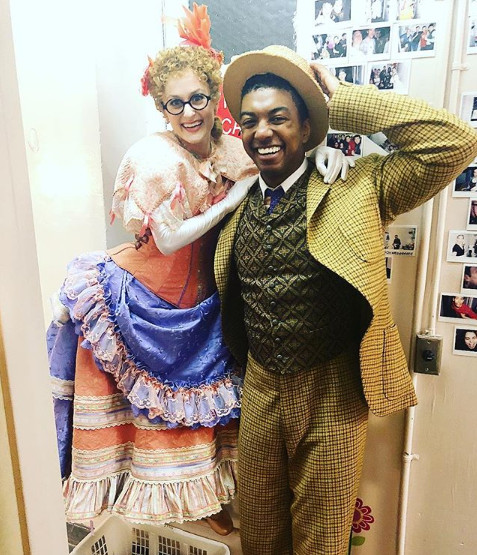 Amanda LaMotte and Christian Dante White in Hello, Dolly! Last week, I was so lucky not only to go on in my understudy track (Minnie Fay) in Hello, Dolly!, but my second show on I got to the theatre to find out that a fellow understudy would also be on in a principal role! Christian Dante White would be playing Cornelius. I went upstairs to get ready and the moment we saw each other we hugged with excitement. Being an understudy is a crazy job, and we often “do the show” together in understudy rehearsal, but the chances of both being on at the same time is rare and exciting. Our little understudy family at Dolly has always been so loving and supportive and it is amazing how we all celebrate one another- so I felt proud that we would both get to play these roles at the same time. Doing the show with Gavin and Christian isn’t drastically different, but something about doing the show with another understudy feels comfortable. We know each other’s timing and inflections and nothing comes as a surprise. We had never done the show with this configuration of actors before, so it was nice to have something about it feel comfortable. There’s also an incredible vibration of energy when an understudy is on- and when there’s multiple, that vibration is so much greater. It’s fun for the whole company but especially for us. It feels amazing to celebrate the hard work each other have done in rehearsal. I feel so grateful to have spent the week playing onstage with each of these two incredibly talented men and I will cherish my time on stage with them both. But I will always remember cheering Christian on from onstage instead of the wings, and how proud I was to see him be such an amazing beam of light on that stage! Understudying is a beast, but when you get to do it with such a remarkable group, it’s one of the greatest joys.